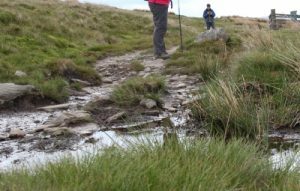 Asset inventories and maps are a fundamental part of effective Trail or Footpath Management. OTISS maintains an inventory of infrastructure, path issues and trees which can be viewed on maps, spreadsheets and reports. We use the terms infrastructure or furniture as general terms for items of outdoor furniture, for example: signs, notice boards, waymarkers, gates, stiles, kissing gates, fence, barriers, benches, bridges, culverts, etc. 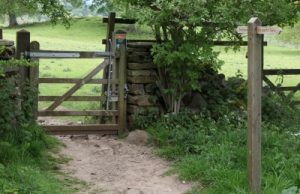 Normally a trail or footpath network is broken down into a number of ‘sections’ or ‘sites’ for administative purposes. For example: a linear section could be 1 to 10 miles long; or a site could include all the paths on a particular farm or estate. 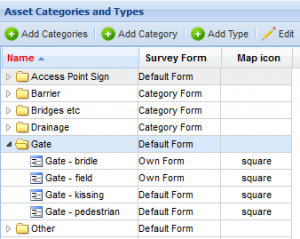 Within OTISS, these sections and sites form the basis for carrying out surveys and generating reports. All infrastructure items, trees and path issues are assigned to these sections/sites. Larger sections/sites can also be created to group together the low level sections/sites. These are useful for generating summary/collated reports. For example: all sections managed by a ranger or office; all sections controlled by a county council or national park; or whatever criteria you need for reporting. It is normal practice to start a management programme with a comprehensive baseline survey. As part of a this survey you would identify and plot all infrastructure (outdoor furniture) along the trail and the locations of all high risk trees. OTISS maintains a geographic information system (GIS) based database of your assets. OTISS stores details on location, species, size, description, condition and all the other information you need for tree and infrastructure management. Most of the fields can be customised to suit the organisation’s requirements and meet the National Trail Quality Standards. Photos can be taken as part of each survey. Good photos reduce the need for detailed descriptions, and speed up the survey process. If you have existing spreadsheets, databases, KMLs or shapefiles with relevant infrastructure data, we may be able to load these into OTISS. Please contact us for more information on what can be done. Identifying, monitoring and rectifying path issues are important aspects of keeping the footpaths open and safe. Various types of path issues can be defined. They each have a location, shape, extent, description, condition, etc. The fields can be customised to suit the organisation’s requirements and meet the National Trail Quality Standards. Issues may be rectified quickly, or may become a longer term issue that will require re-surveying and updating. In addition, PDFs, Word, Excel and other document types can be stored with each tree. For example, old survey documents, internal decay analysis (e.g. from Tree Diagnostics), tree vitality reports (e.g. from Arborcheck), etc. 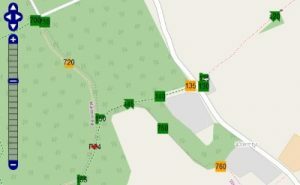 The infrastructure items, trees and path issues can be displayed using online maps (e.g. Open Street Map, Google) or your own trail maps. Upload your own trail maps, site plans, Ordnance Survey maps, OS Mastermap, geo-referenced maps, CAD drawings or aerial photos. Plot directly onto these plans using the mobile survey apps. The standard pan and zoom features allow you to move around the map. Clicking on an icon allows you to view or update the item’s details. Both the web-based Map page and the Path Survey Android™ app provide very easy ways of adding new items. Simply click on the map and enter the information you have available. Infrastructure/furniture can be shown as points (with a choice of icons), lines or polygon shapes. Groups of trees and hedges are shown as polygons, and can be reshaped as required. Trees can be re-positioned by simply dragging them to a new location. 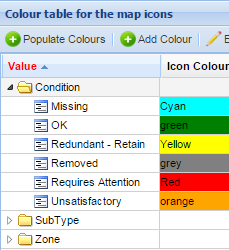 Configure the icon colours by selecting which survey data field to use, and map the survey values to your choice of colours. For example: a simple Red/Orange/Green system for Condition, RiskCategory, WorkDue, etc. ; or something more complex – you decide! “list all the path issues and order them by length”. “list all the ash trees and order them by age class”. 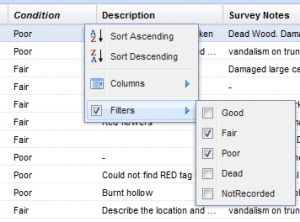 All the survey data and recommendations can be downloaded into Excel spreadsheets. OTISS provides some pre-defined layouts, but you can set up your own Excel Report Templates (styles, columns, charts, etc) and OTISS will fill in the data. You can use OTISS to collect and collate inspection data, and then perform your own specialised analysis and reporting.